The idea that creative geniuses might not be entirely sane isn’t exactly new. But just how much do creative types have in common with people suffering from psychosis? Well, according to Daniel Nettle at the University of Newcastle, serious poets and artists have just as many ‘unusual experiences’ as people diagnosed with schizophrenia. What saves them from the disabling effects of schizophrenia is that they don’t suffer from the lack of emotion and motivation – known as ‘introvertive anhedonia’ – also associated with the illness. 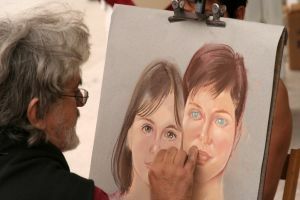 Link to related Digest item suggesting virile artists are to blame for schizophrenia’s prevalence. Social, creative – that’s physics! Intersting I am considered both of these catagories, but I have been told that “It’s strange my emotions aren’t flat considering my diagnosis” and “you get really weird when you dont do art.